I have a small confession to make. I chased on 8/5 and I didn’t write anything down about it at all. Sorry. If it makes you feel better it went fairly poorly. You didn’t miss anything. Here’s the short version. I didn’t feel good that morning, but decided to chase anyway. I left the house way too early and got to my target (Limon, CO) way, way too early. I started feeling worse while sitting at some closed down bank, so I drove home. Later I felt better, but was frustrated by my earlier trip so I didn’t go back out. After a few hours it started looking really good on radar (I was checking occasionally while watching movies) so I grumped about it a lot. Wah. However that was last week. This is today. Tuesday morning’s NAM and HRRR Supercell Composites pointed toward the areas of La Junta as a good preliminary target. I ate lunch before I left, which was uncharacteristically responsible of me. I got out the door around 1PM, hoping to avoid my previous mistake. Google Maps had me heading out east to Limon, then dropping due south through Punkin Center 1There’s one of these in Arizona too. Popular town name I guess. to La Junta. 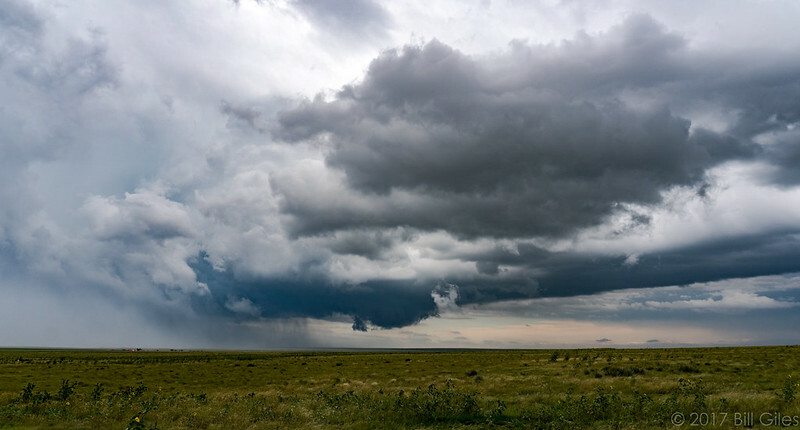 I got a text message while enroute from a couple local chasers I met last year (a bunch of us are in a big text list, which is usually interesting but sometimes annoying depending on the time of night) talking about a nice looking cell up near Cheyenne, Wyoming. I checked Radarscope and questioned my life decisions, but while it did look good I opted to stick with my game plan. Continuing on, I occasionally peeked at Radarscope and cells were blowing up around Colorado Springs and Pueblo. This had me doubting my current route which had taken me so far east, and I kept debating swinging back toward Denver and finding a more southerly initial approach. I didn’t do it. Passing through Limon quickly, I found CO-71 was nice and empty so I took my time and enjoyed the trip. 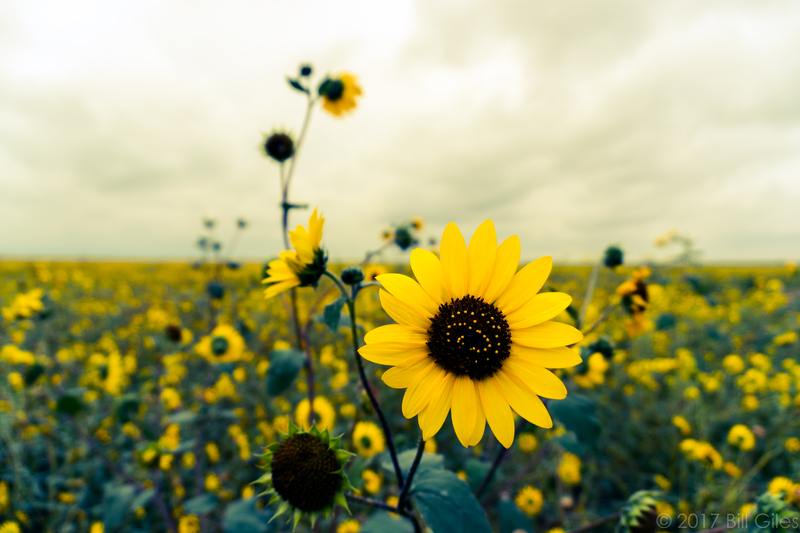 Somewhere just south of Karval, I found a field of sunflowers and successfully chased them. I did this sort of by accident while working on this photo in Lightroom. I like it, in an album cover way. I stopped very briefly in Ordway and checked my radar. Severe storms had been dumping rain on Pueblo during my drive and were now heading southwest out of the city. 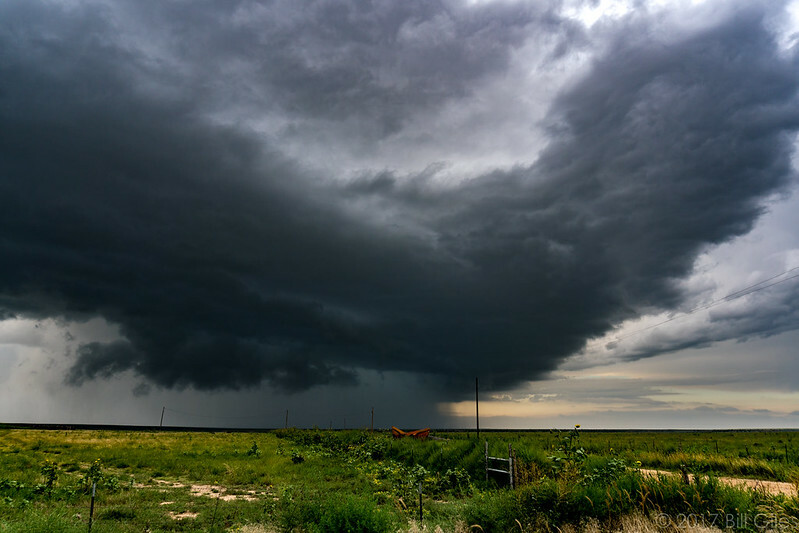 One of them was still severe warned and looked to be a fully mature supercell. While I was checking, the radar updated again and now the storm showed an ETVS 2Elevated Tornado Vortex Signature. Indicates significant rotation higher up in the storm, which sounds cool but doesn’t necessarily mean anything as far as chasing goes. It could become a full TVS later, so it’s food for thought when choosing targets.. Unfortunately this a later picture. An earlier look would have shown a more difficult choice. Oh look, it’s a discrete supercell. Just sitting there on the highway. What to chase? The radar image above makes this an easier decision, but just ten minutes before the storm to my west showed up as organized, with an ETVS, and this little cell wasn’t even severe warned. I chose the isolated supercell for a few reasons. I kept my options open until I hit Rocky Ford. That way future radar updates could help me make a more informed decision. 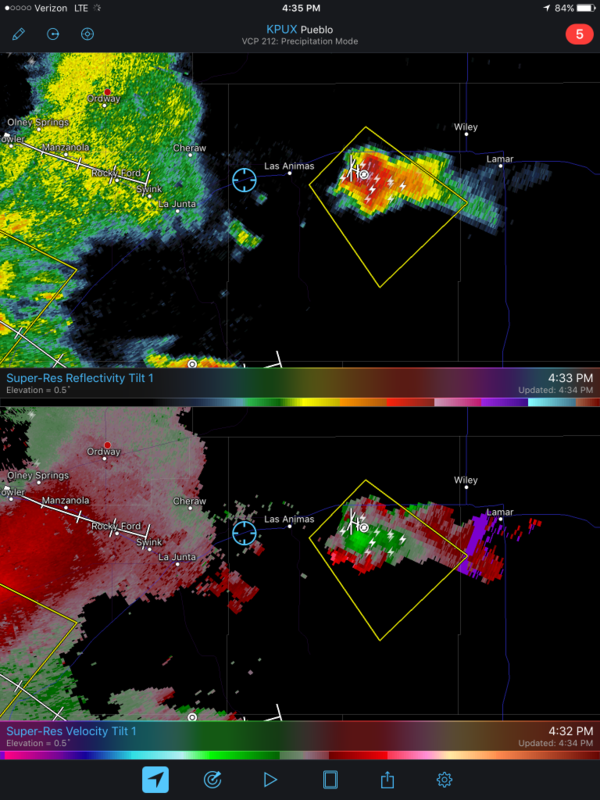 Once I got into La Junta the Pueblo storm started showing signs of gusting out on radar (as seen above). The main show would now be over and all I’d get was a torrential downpour and maybe a shelf cloud if I was lucky. Discrete. Supercell. They’re the ones to watch. It’s still sitting there, almost like it’s latched to an boundary, and shows no sign of weakening. I trudged through Rocky Ford, Swink (ha! ), then finally La Junta. I kept to the speed limit, partially out of respect for the small communities, partially out of respect for the sheriff’s truck pacing me through town. 3Mostly the latter. But yeah, don’t speed through small towns. New plan: Get to Las Animas, then turn south onto CO-101 and find a side road to pull off and check out the situation. This worked out pretty well. There was also quite the hail core just to my east. 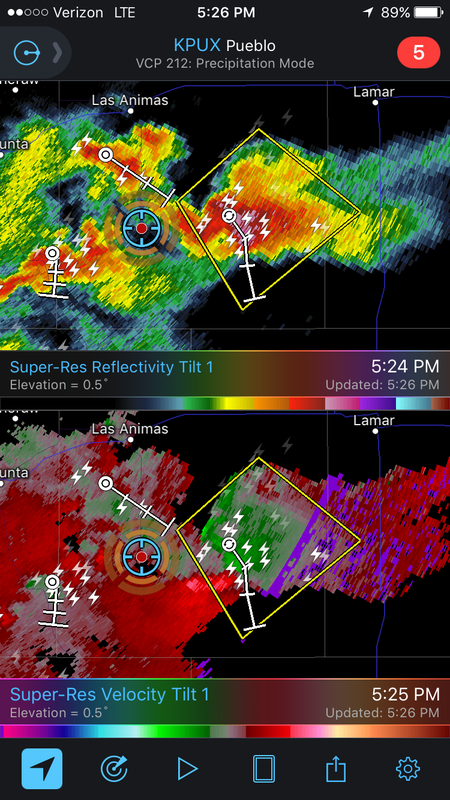 I stayed for about ten minutes, then realized that I was about to get hit from behind from both the original Pueblo storms as well as a new cell going up just NW of me. My storm had now decided to drift south, and the hail core was really starting to obscure anything that might be happening. I got back onto CO-101 and turned south again, marveling at my cell signal, a solid five bars for most of the time! This was a new exciting thing to have. Most of the time I’m end up in the middle of nowhere, relying solely on visual cues to continue my chase. I stopped a couple more times on CO-101 for pictures. The storm was still severe warned and was looking great. A great position to be in…for now. Both storms on either side of me aren’t going to intersect, but that storm just north of me is dumping rain on my escape route. I continued south. My road was difficult to see on Google Maps for some reason, unless I zoomed way in . Odd. A minute later I lost cell service completely. That’s pretty much normal. No problem. I had a good view of the storm and could identify where everything was. Then I lost my asphalt road. Ok…dirt road it is. Not liking that. Then I lost my storm visibility because of a ridge just to my east. Well then. I needed to stop and think about this. I pressed on for another half mile or so, got to a small break in the ridge and stopped looked out at the storm. There’s now alarm bells going off in my head. Let’s count them up. The map. The road showed as continuing through to Deora, a tiny community about 30+ miles away at this point. 30 miles of potentially dirt road in unknown conditions. Also, it’s jogging to the southeast, putting it (and me) eventually into the storm’s predicted path. There’s no other road options. The storms that were pursuing me from the west and northwest have now passed through my original position, dumping unknown amounts of precipitation 4Not just a fancy word for rain, I’m thinking about large amounts of hail too. onto my dirt road. The same road I’m now about 8-10 miles down. If I don’t turn around soon, I’ll have no choice but to continue south or face getting stuck. I have been about 10-15 minutes with a radar update, which means I can’t confirm this suspected direction change or see any storm status changes. The road is definitely taking me more southeast than south, meaning that I’m on a collision course with it if I can’t keep ahead of it. The dirt road will make that difficult. So. No information. No escape options. No visibility. Possible storm motion change. The Red Cross Tornado app popped up to yell at me that something was going on. No text, just a tornado warning. Radarscope partially updated, with this. I said a lot of really bad words at this point. The number of emotions I was feeling simultaneously was crazy. I was pissed at myself for bailing. Upset I was going to miss a very likely tornado. Frustrated at the lack of road options. Relieved I’d made the safe decision. Angry again because that felt really lame and I should have just gone through. Frustrated that I couldn’t risk the dirt roads again because the storm would be cutting me off completely at this point. Speaking of around, I spun around and took off south again back to where the asphalt ended, then got out to look. Nothing. Nothing but white clouds hiding everything and anything that might be going on. 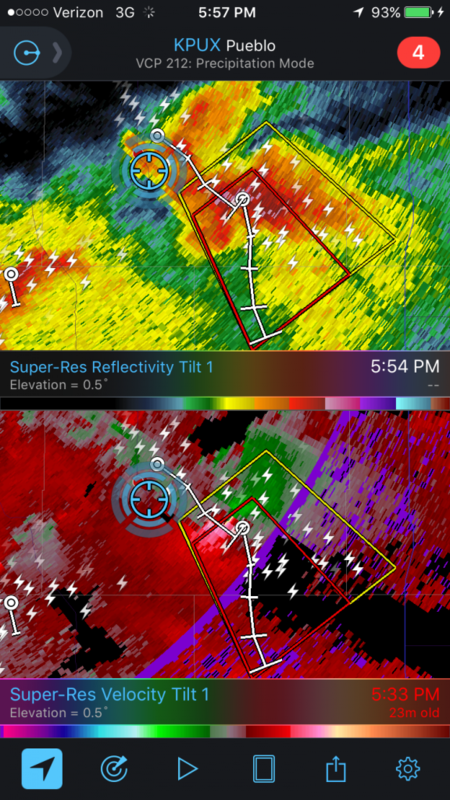 According to Radarscope, I am the ONLY chaser 5Reporting my location to Spotter Network, anyway within MILES of this storm. This NEVER happens. I’m on the only storm in the ENTIRE STATE to throw a tornado warning so far today, and I can’t SEE ANYTHING. I turned back north again and drove until I got my cell signal back, then called Heather and ranted at her a little. She listened, sounding a little nonplussed about the whole thing. I wound down and told her I was thinking about heading for another cell just south of Kim. CO. southwest of my current position and she told me to have fun. I didn’t go to Kim, though. I went back to Las Animas and then headed west to La Junta. While in La Junta I checked radar one more time and decided that this was all going to merge into a big MCS 6Mesoscale Convective System – i.e. a big pile of thunderstorms that I won’t be able to see anything in. so I decided to get some dinner and head for home. I ate Carl’s Jr. and it was about as exciting as this sentence is. Driving home, I got to think about the day more. I was excited to be back out in the field and to have made so many good choices that led up to that storm. I picked a good preliminary destination, didn’t get distracted from the real prize by an ETVS thrown from a dying storm, had a good intercept plan….and then it all went to hell. I could have made it. I could have possibly seen and photographed a tornado that only I would ever have seen in person (if one was there). A tornado with an audience of one. The storm chaser’s dream. If I made a different choice. I slept on it, then thought about it a lot more while writing this post. Yeah, I think made the right choice. Continuing south-southeast would have had me running right into the storm’s track. There may or may not have been a tornado, and it may or may not have been visible. 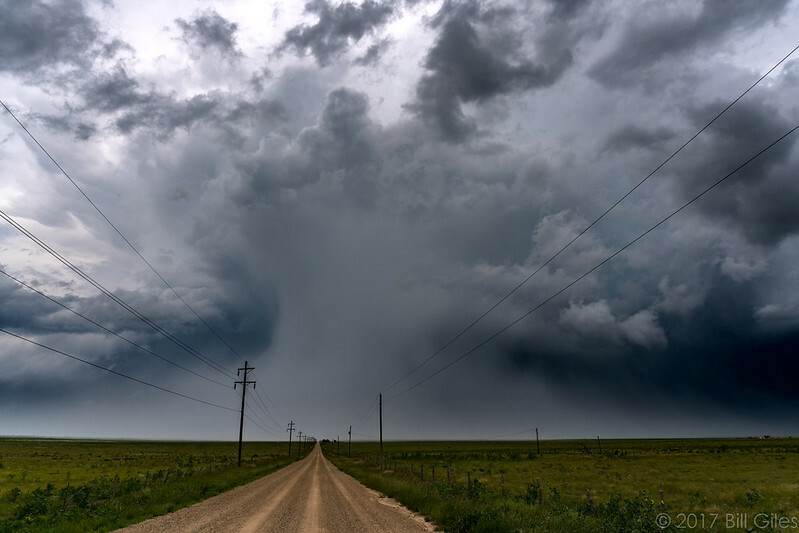 Any problems with the road would mean an abrupt end to my chase, and an almost immediate paying of the piper as I got swallowed by the very storm I was after. At best, I was looking at washed out roads, mud, and some hail damage. I should probably stop less while on the way to my target. I stopped a couple times to mess with sunflower fields, and I could be doing stuff like that on the way home (on a day where I’m busy not hating myself for aborting my chase). Sounds like you’re having fun again, Bill, in an off-and-on sort of way! Love the sunflowers, by the way.